User testing has taught us that searchers much prefer the view-all, single-page version of content over a component page containing only a portion of the same information with arbitrary page breaks (which cause the user to click “next” and load another URL). 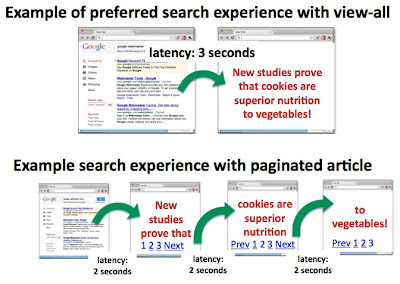 Searchers often prefer the view-all vs. paginated content with arbitrary page breaks and worse latency. Therefore, to improve the user experience, when we detect that a content series (e.g. page-1.html, page-2.html, etc.) also contains a single-page version (e.g. page-all.html), we’re now making a larger effort to return the single-page version in search results. If your site has a view-all option, there’s nothing you need to do; we’ll work to do it on your behalf. Also, indexing properties, like links, will be consolidated from the component pages in the series to the view-all page. 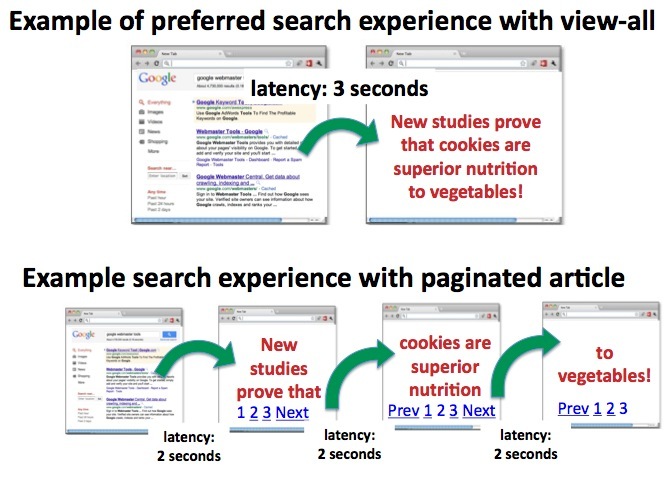 Interestingly, the cases when users didn’t prefer the view-all page were correlated with high latency (e.g., when the view-all page took a while to load, say, because it contained many images). This makes sense because we know users are less satisfied with slow results. So while a view-all page is commonly desired, as a webmaster it’s important to balance this preference with the page’s load time and overall user experience. We aim to detect the view-all version of your content and, if available, its associated component pages. There’s nothing more you need to do! However, if you’d like to make it more explicit to us, you can include rel=”canonical” from your component pages to your view-all to increase the likelihood that we detect your series of pages appropriately. rel=”canonical” can specify the superset of content (i.e. the view-all page, in this case page-all.html) from the same information in a series of URLs. 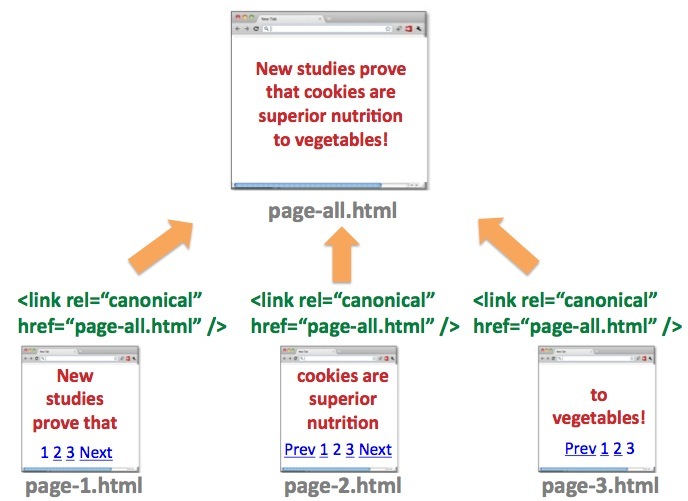 In the diagram, page-2.html of a series may specify the canonical target as page-all.html because page-all.html is a superset of page-2.html's content. When a user searches for a query term and page-all.html is selected in search results, even if the query most related to page-2.html, we know the user will still see page-2.html’s relevant information within page-all.html. On the other hand, page-2.html shouldn’t designate page-1.html as the canonical because page-2.html’s content isn’t included on page-1.html. It’s possible that a user’s search query is relevant to content on page-2.html, but if page-2.html’s canonical is set to page-1.html, the user could then select page-1.html in search results and find herself in a position where she has to further navigate to a different page to arrive at the desired information. That’s a poor experience for the user, a suboptimal result from us, and it could also bring poorly targeted traffic to your site. However, if you strongly desire your view-all page not to appear in search results: 1) make sure the component pages in the series don’t include rel=”canonical” to the view-all page, and 2) mark the view-all page as “noindex” using any of the standard methods. The view-all page is undesirable as a search result (e.g., load time too high or too difficult for users to navigate). Your users prefer the multi-page experience and to be directed to a component page in search results, rather than the view-all page. Consolidate indexing properties, such as links, between the component pages/URLs. Send users to the most relevant page/URL from the component pages. Typically, the most relevant page is the first page of your content, but our algorithms may point users to one of the component pages in the series. It’s not uncommon for webmasters to incorrectly use rel=”canonical” from component pages to the first page of their series (e.g. 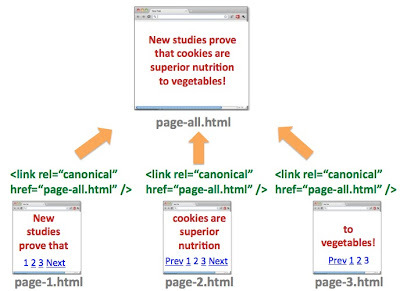 page-2.html with rel=”canonical” to page-1.html). We recommend against this implementation because the component pages don’t actually contain duplicate content. Using rel=”next” and rel=”prev” is far more appropriate. If a view-all page doesn’t provide a good user experience for your site, you can use the rel=”next” and rel=”prev” attributes as a strong hint for Google to identify the series of pages and still surface a component page in results. As always, feel free to ask in our Webmaster Help Forum. Note: The information in this post may be outdated. Rel=prev/next is not an indexing signal anymore.